LOTUS&ASH cards are featured in Williams Sonoma’s Valentine's Day baskets, which means that two of our favorite things (paper and wine) are married together to create the perfect gift! We’re thrilled on so many levels to be included in these gifts and we've also updated our own store with this year's collection of valentines. We like to keep shipping free, so order by 02/07 to receive your card(s) before Valentine’s Day. Excited to update you on all the other fun stuff L&A has in store for you this year. Until then, send some love. You use your TaskRabbit app more than Uber. Your family, friends, and boyfriend are now expert envelope liners, ribbon tie-ers, and even watercolor artists. Your Instagrams are about as frequent as Halley’s comet. Yes, it’s time to expand the LOTUS&ASH team with a seasonal hire! In the Bay Area and interested in helping out part-time with design and stationery projects? Check out the new jobs section of the website. Know someone that may be interested? Submit their information through the form below. For every successful hire, the referrer will get a custom set of stationery as thank you present (a.k.a referral bonus). We're moving into a new, larger, space in the gallery, and looking for someone to share it with. A gorgeous office space with exposed brick and storage is now available and we'd love for a fellow creative and/or entrepreneur to move in with us! Contact us for more details. When I moved to San Francisco in 2010, I immediately fell in love with the Jackson Square neighborhood filled with its rich artistic history, and tucked between North Beach and the Financial District. I regularly shared a glass of wine with a friend at Barrique (now closed), or tried to snag a reservation at Cotogna (reservations still difficult). Most of all, I was intrigued by a building at 708 Montgomery - the Canessa Printing Company - which sits in the shadow of the Transamerica building. Five years later, I stumbled upon a Craigslist ad for office space in an “artistic community and gallery in Jackson Square” and knew immediately that it had to be Canessa. LOTUS&ASH now calls this building home and I love working in such a dynamic space with such historic and quirky architecture. Now, thanks to Hoodline, we can all know a bit more about the building’s story, including this photo from the San Francisco Library Archives. Though the Black Cat Bar may be gone, there is still lots of good food and drinks to be had in Jackson Square. I encourage you to join me at one of my current neighborhood favorites. Reveille: High octane coffee, beautiful cafe. Do not miss their Chocolate Chip Cookies. Trestle: Delicious and oh-so-affordable pre-fixe dinners. Say yes to the Pasta course. Old Ship Saloon: Complementing your Happy Hour with their fries is never a bad choice. 79 | Welcome to the new site. I’m excited to share version 3.0 of the LOTUS&ASH website. With an updated information architecture, all-new photography, and a better shopping experience, a long overdue refresh is finally complete! Version 1.0 was an experiment in static HTML launched in 2008. Then in 2013, I finally migrated all the content to Wordpress. Two years later, my quest to find the perfect website platform continues with Squarespace. Why the switch from Wordpress to Squarespace? 1) Its ecommerce and Stripe integrations make selling products online easy-peasy 2) Its "curated typography" makes it simple to use super tasty web fonts, and 3) Its documentation, ease-of-use, and mobile optimization make for quick development and updates. Since making things official earlier this year, LOTUS&ASH has been busy building new brand identities, setting up shop in Jackson Square, slowly but surely building an Instagram audience (don’t forget to follow! ), and collaborating with some amazing illustrators, content strategists, and printers. This new site will showcase a few of these projects in months to come, and watch for new products in the Shop quarterly. Browse my favorite fonts, colors, and custom patterns for stationery, invitations, and more. This is a great resource for current and future customers and will be built out to include some tips on modern etiquette as well. Holy moly! I’ve had the pleasure of working with some wonderful couples and created some unique designs to celebrate their love and share their story. Interested in working together on an upcoming wedding project? Complete an inquiry form. Here's a one stop shop for a look at work from the past 10 years including both paper and brand projects. There's also plenty of new photography, thanks to a great lens from Samy’s Camera and a week of natural light in the LOTUS&ASH studio. A selection of LOTUS&ASH greeting cards, personalized stationery, and invitations are now available through the LOTUS&ASH shop and ETSY. Each set of stationery and boxed greeting cards comes with a goodie bag filled with paper goodies including gift tags, WASHI tape, and stamps! Why? Because goodie bags are the best. You know what else is the best? Promo codes! For the next month, get 15% off of your LOTUS&ASH shop purchase with the code: LAUNCH2015. I hope you find inspiration throughout the new site! If you have any feedback (or find a bug! ), ping me at ashling(at)lotusandash.com. I thank you in advance for your QA! I'm 4 days into my first week working on LOTUS&ASH full-time. There are lots of decisions to make, designs to create, and paper to send, and I've been spending my days between Coffee Bar SF and Saint Frank, and running around Crissy Field starting to make sense of it all. As I think about how to scale L&A from what it is today to what it can be tomorrow, I couldn't pass up the opportunity to create a Valentine's Day collection - a set of cards to celebrate love on Feb. 14 or any day you feel like making someone swoon. And, for the first time ever, all these cards are available for purchase on the new LOTUS&ASH shop on Etsy! Hurry up Supreme Court! In the meantime, let's celebrate everyone's right to love. 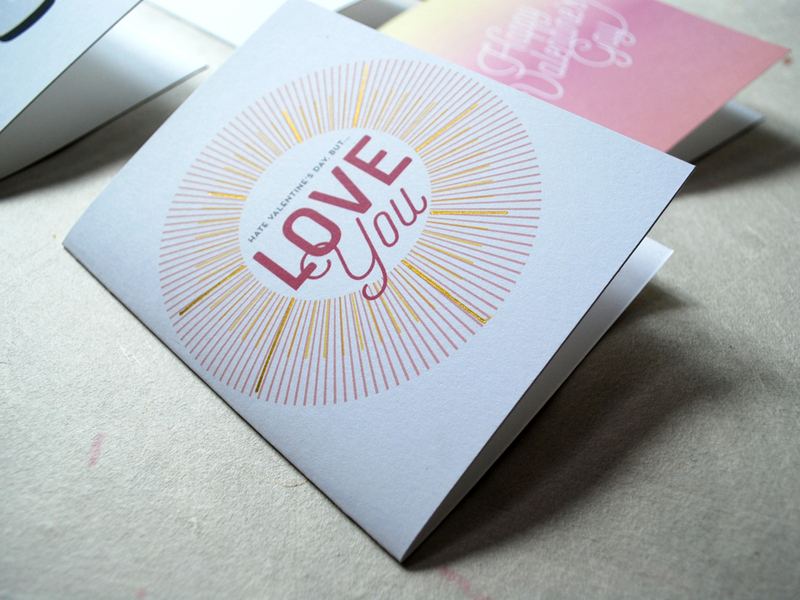 All cards are flat-printed, blank on the inside, and available on Etsy. Shipping for Valentine's Day until Feb. 10. Valentine's Day is one of my favorite holidays to send love with paper. Check out the archives! 2013, 2011, and 2010.